today we unplanted the garden. from the 33 year old dogwood to the last baby earthworm. we unearth old abe darby who has been pushing his mighty rose roots down into this soil since 1992. he is surely very pissed as we prune his new autumn colored shoots and buds to fit him in the van. this rose has given us fat fragrant apricot blooms every year till the edge of december. he must think we are ungrateful. we drag him through the store, his roots stuffed into an ugly black plastic tub. he flails at the debris on both sides and triumphs by nailing my scalp with one long angry thorn. we load the van with potsful of hosta,hydrangea,cotoneaster,blueberry,columbine,foxglove and hope that those clumps of roots we can't identify are the so special uvularia, hardy orchid and dodocatheon that are not easy to replace. it is amazing how something once so extraordinary as a whole loses its magic when broken down into separate parts. i would like to end on a happier note. reading this and wondering who will care and understand, i think only a gardener who has lost a garden will get it. 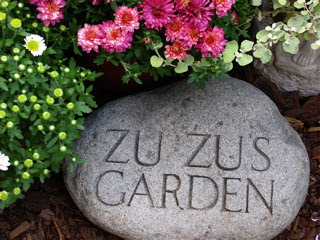 zuzus petals has been part of the park slope culture since 1971.
if this means nothing to you, better to ....what is the verb...? blogoff. i am totally unsure of what a blog is and what this will translate into and who out there will locate this piece of writing and be interested. this is an experiment...a tentative toe extension onto thin ice into a world i do not comprehend. i am brave, although certainly not fearless.this feels very strange. the facts: this last august 26th my flowershop was destroyed by a fire that began in the restaurant next door.it was one of those things that reminds you of john lennon's lyric" life is what happens when you're making other plans".so i am re-building my shop and my life. it seems essential to grow my business on the internet and a friend suggested this blogthing. so here i am at my keyboard in brooklyn, trying to write something that does not totally humiliate me. how silly. i have stood behind the counter in my shop for 33 years selling flowers and plants and listening to people talk about their lives and their thoughts and their feelings.it is a good way to earn a living.